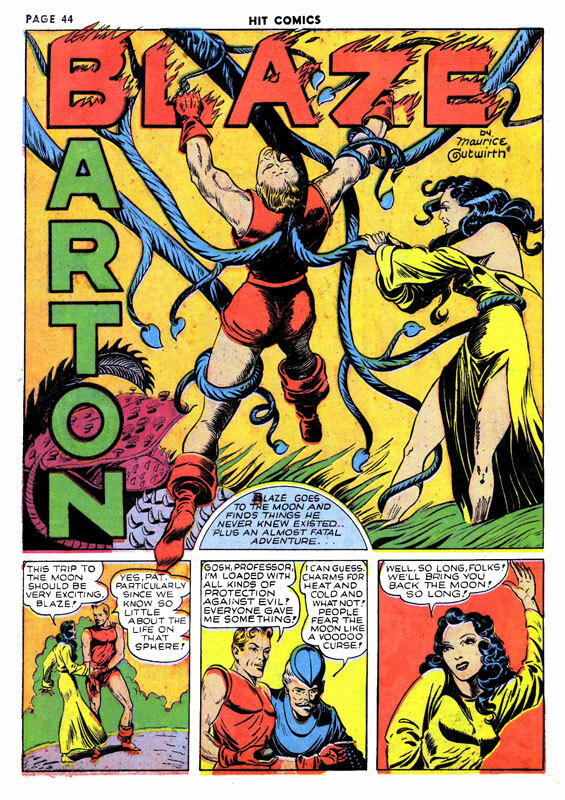 Golden Age Heroes: BLAZE BARTON and the Tentacles of Doom! BLAZE BARTON and the Tentacles of Doom! Here's an irresistible golden-age classic! Well, probably not a classic. 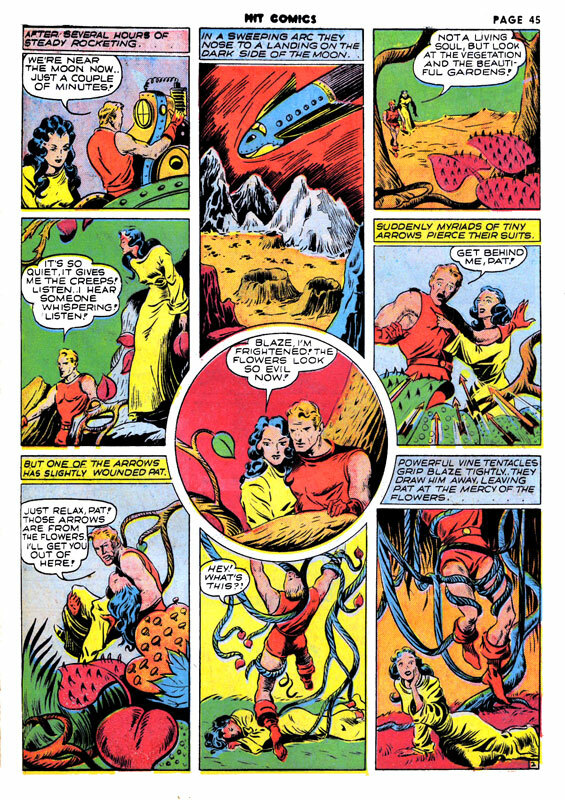 But who can resist a story that's only 4-pages long where the hero is ensnared in tentacles on every page and by the end of the story loses his shirt!!! 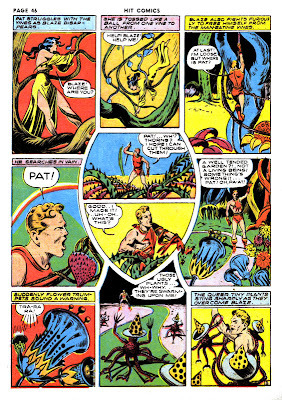 Blaze Barton travels to the Dark Side of the Moon in HIT COMICS #12 (June 1941). written by ? ; art by Maurice Gutwirth. It's cute (on page 4) how he gets so into playing with the tentacles that he completely loses track of the girl he's trying to rescue. Guess a guy's got to have his priorities!! MASTER MAN, World's Greatest Hero! 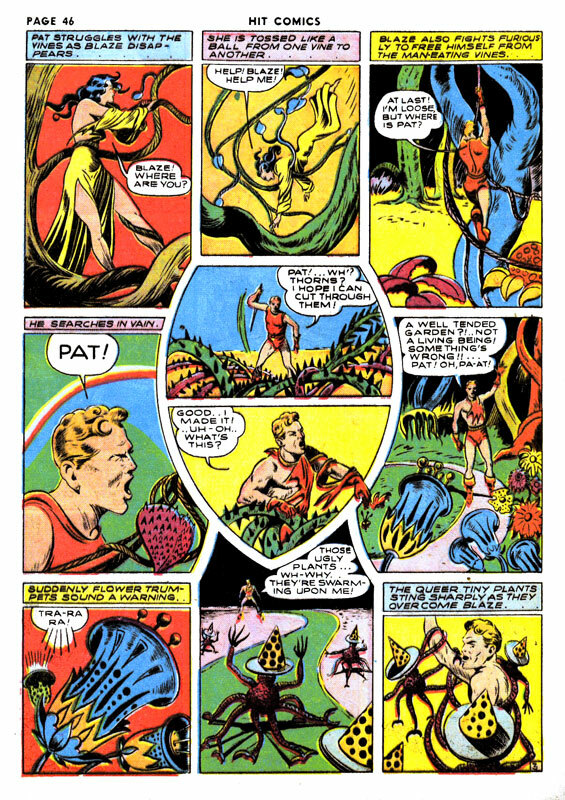 The (third) Golden Age HERCULES! The Secret Origin of SAMSON! Plus DAVID! The Perilous Debut of MISS MASQUE! The Secret Origins of The FLAME & FLAME GIRL! The Secret Origin of The FIGHTING YANK! Long arm of THE CLAW! The Secret Origin of The DAREDEVIL! GREEN LAMA and the Prize Fighters! The Secret Origin of NEON THE UNKNOWN! The Secret Origins of THE BLACK TERROR & TIM! The Secret Origin of BOY KING! Ribaldry with AMAZING-MAN and TOMMY! SAMSON and DAVID: Boys Will be Boys! PHANTASMO: The Master of the World!